Web Desk: Sonam Kapoor and Anand Ahuja’s marriage was the center of public attention this week, but it seems that their marriage disappointed the religious group in Punjab and hurt the sentiments of Sikh community. 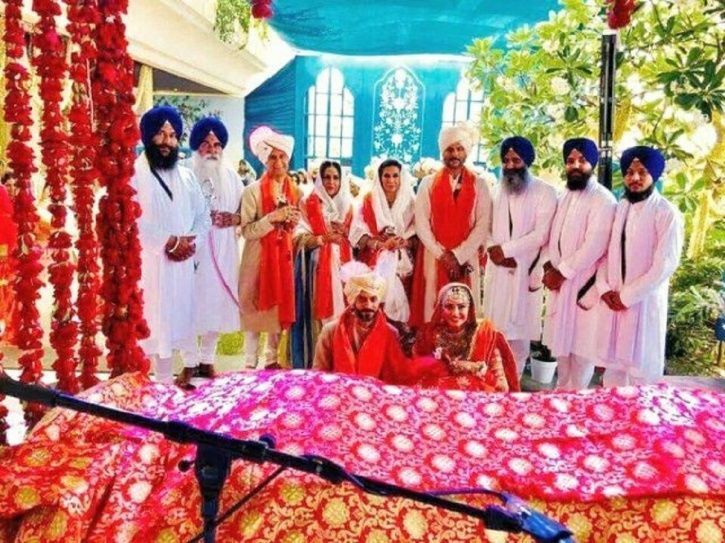 Recently, their traditional wedding ceremony has become controversial over the violation of the Sikh ‘rehat maryada’. For Anand Karaj ceremony, Guru Granth was brought from the golden Temple in Amritsar and former head priest Jaswinder Singh was also there to bless Anand and Sonam. The former SGPC general secretary Sukhdev Singh Bhaur and former Panj Pyaras has accused that SGPC staffers overlooked that Anand’s Kalgi from turban was not removed in the presence of Guru Granth, which is a violation. According to the Sukhdev Singh Bhaur, It was a violation of Sikh tenets if anyone sits before Guru Granth with a kalgi on turban, because this seems that the person is equating himself to the stature of Gurus. Now they are demanding strict action against the SGPC staffers.